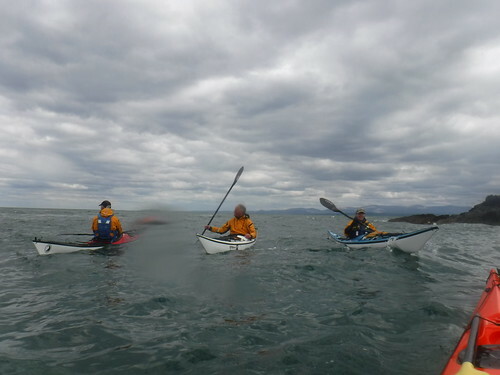 Saturday 30th April was the first day of the Anglesey Sea kayak symposium. 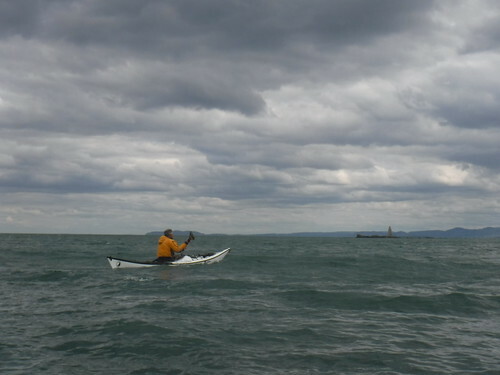 Now, we are not an antisocial lot, but prefer sea space when playing in tide races. We are also lucky enough to have regular access to the well known spots of the West Coast, so tend to ‘go East’ on this busy weekend. The day started with a coffee, planning and usual banter in the Holyhead Truckstop before launching from Porth Eilian. 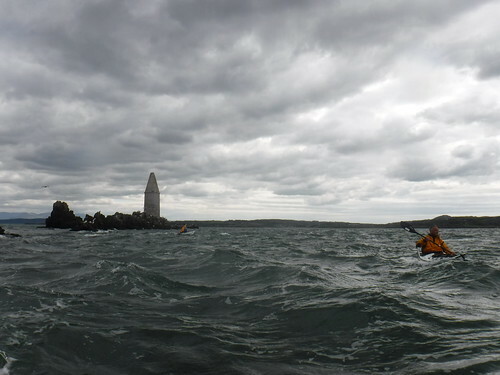 The West side of Trwyn Eilian / Point Lynas provided a sheltered and scenic ‘bimble’ with lovely rock architecture before the headland is reached. For the Geologically minded, these rocks are of the New Harbour Group – Mica Schist And Psammite. Metamorphic Bedrock formed approximately 542 to 635 million years ago in the Ediacaran Period. Originally sedimentary rocks formed in deep seas. Later altered by low-grade metamorphism. Trwyn Eilian is a significant obstacle to fast moving tides. The South East (flood) starts around 5 hours 30 minutes after High Water Liverpool. The North West going Ebb Stream starts around 30 minutes before High Water Liverpool. 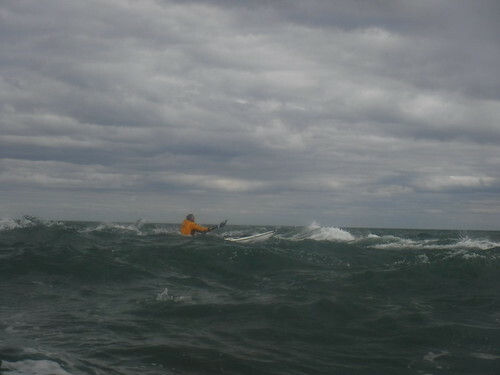 The ebb was due to start at 1330 and we arrived with swirlings and buoy movements suggesting an early start to the ebb. 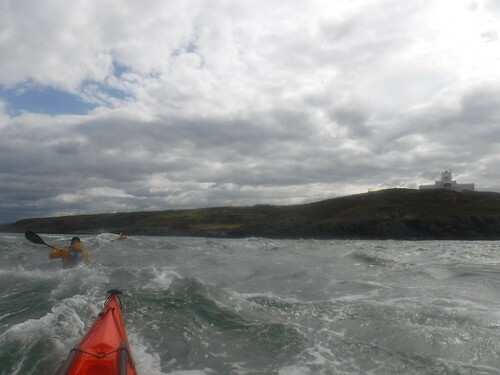 Not enough to hinder our onward passage to Ynys Dulas, we were now exposed to the Southerly wind which was doing it’s best to slow us down! We chose a line crossing Freshwater Bay, close to shore at Porthygwychiaid and stopped for an early lunch at Porth Helygen (Willows). The beach hereabouts being a very narrow strip of rock, shingle, ‘plastic cups and sea shells, spewed from curling reach’ as we were close to Highwater. After lunch, the ebb had got going! And called for a significant ‘ferry’ angle to Ynys Dulas. I’ve often found this an interesting area. Exposed to wind from most directions, it seems to be in line of the confluence between main tidal streams and water emptying from Dulas Bay. Arrival at Ynys Dulas is a joy! Boats quickly surrounded by inquisitive heads of Grey Seals, the ubiquitous smell of guano delivered by many Cormorants. The island is mainly rocky, but at low tide sand is exposed, most noticeably on the southern part of the island where it separates the main rock formation from two smaller ones named Garnog (‘Hooved’). A smaller rock called Garreg Allan (‘The Outer Stone’) is found about 100 m behind the island. The island also marks the termination of an old limestone headland which geologically separated Dulas Bay from Lligwy Bay and Red Wharf Bay. On the island is a beacon. Today dominated by ‘head honcho’ Cormorant, it is a cylindrical structure with a cone shaped top, built in 1821 by James Hughes of Llys Dulas Manor to store food and provide shelter for shipwrecked seamen. There is evidence from a map drawn up in September 1748 by Lewis Moore that the island was once known not as Ynys Dulas but Ynys Gadarn (‘Strong or Mighty Island’). Fascinating stuff! But it was time for us to take the escalator (ebb tide) back to Lynas and of greater importance, leave the birds and seals in peace! Geth had a Red Hot Date with his Wife, Kirsty and Daughter Heidi and the promise of a night in their campervan following a Red Hot Curry! (Hmmm…) Paul and I had the promise of a play in the ebb race off Lynas!! Goleudy Trwyn y Balog or Point Lynas Lighthouse grid reference; SH 479936 If you are here at night, look out for ‘Occ. 10s. 39m. 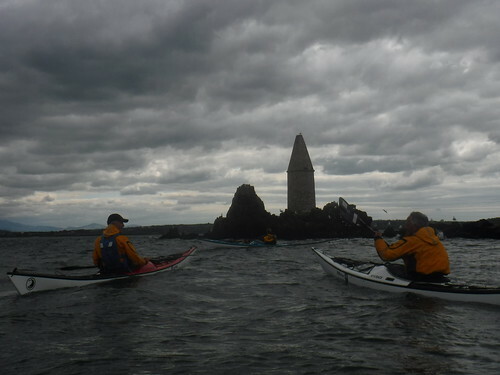 20M’ The lighthouse is a distinctive feature along this section of coast. It was designed by Jesse Hartley engineer to the Mersey Docks and was also responsible for the World’s first great floating dock system at Liverpool. The present lantern dates from about 1874. In 1952 the station was electrified and the mechanical elements of the original light-shutter were removed. The light was automated in 1989 and is now controlled from Holyhead. By now, Lynas race was running at full spring tilt of nearly 5 knots. 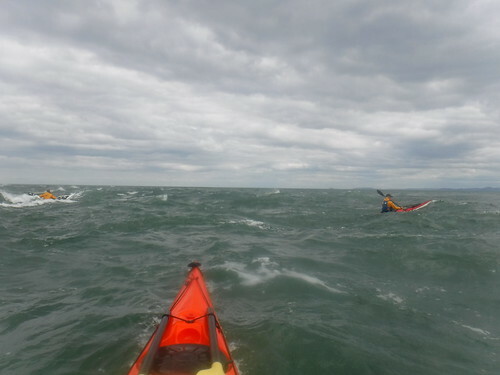 Surging, steep waves were very playful and occasionally challenging. Easy access to an ‘eddy return escalator’ made for great fun! Gethin ‘coaching’ Rachel to a new technique whilst terrified of the wrath of our Mancunian Lady if it went wrong, sharpened his technique to a higher level! The easy return to Porth Eilian was again, a true joy! Oh, I nearly forgot. The Girl in a Dress? Well, I had to say something to gain attention! Young Rachel had a ‘Senior’ (has our youthful friend started early?) 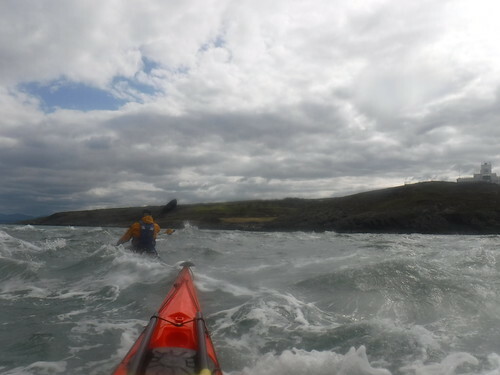 moment and left some paddling kit at home. Improvising and resourceful (although Rachel didn’t accept all our ideas), we fashioned kit from a spare spray deck, my XL Storm Cag (Rachel’s natural size is probably XS) and assorted bits and pieces. We thought she looked rather fetching! Rachel said it was like; “paddling in a dress”! Take her word for it, but she did stay dry! …..And we all had a ‘wet’ to celebrate another great day!